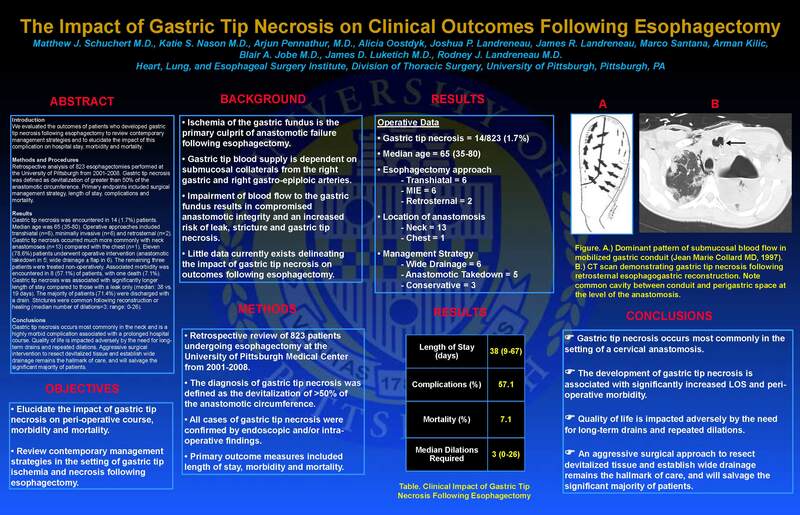 The Impact of Gastric Tip Necrosis on Clinical Outcomes Following Esophagectomy. Anastomotic complications are frequently encountered in the setting of esophagectomy, with leak rates ranging from 10-20%. Complete necrosis of the gastric tip is a rare complication that can be associated with significant morbidity and impairment of quality of life. In the current study, we evaluated the perioperative outcomes of patients who developed gastric tip necrosis following esophagectomy to review contemporary management strategies and to elucidate the impact of this complication on length of stay, morbidity and mortality. We retrospectively analyzed the clinical course of 823 esophagectomies performed at the University of Pittsburgh from 2001-2008. Patients with confirmed anastomotic leaks (radiographic or clinical) were identified. Gastric tip necrosis was defined as devitalization of greater than 50% of the esophagogastric anastomosis, with obvious necrosis of at least 1 cm of gastric tissue distal to the anastomosis. Primary endpoints included surgical management strategy, length of stay, complications and mortality. Statistical comparisons were performed with the t-test and Fisher’s exact test. Gastric tip necrosis was encountered in 14 (1.7%) patients. Median age was 65 (35-80). Only 2/14 (14.3%) patients received neo-adjuvant therapy. Operative approaches included transhiatal (n=6), totally minimally invasive (n=6) and retrosternal (n=2). Among those patients with anastomotic leaks, gastric tip necrosis occurred much more commonly with neck anastomoses (n=13, 2.7%) compared with those in the chest (n=1, 0.3%; p=0.032) [Table]. Eleven patients underwent operative intervention (anastomotic takedown in 5; wide drainage ± flap in 6). The remaining three patients were treated with opening of the wound, packing, antibiotics and TPN or enteral feeds. Associated morbidity was encountered in 8 (57.1%) of patients. There was one death (7.1%). Gastric tip necrosis was associated with longer length of stay compared to those with a leak only (median: 38 vs. 19 days, p=0.17). The majority of patients (71.4%) were discharged with a drain. Strictures were common (n=10, 71.4%) following reconstruction or healing (median number of dilations=3; range: 0-26). Gastric tip necrosis occurs most commonly in the neck, likely secondary to greater gastric wall tension and an attenuated blood supply relative to intrathoracic anastomoses. It is a highly morbid complication associated with a prolonged hospital course. Quality of life is impacted adversely by the need for long-term drains and repeated dilations. Delay in instituting adjuvant therapy may further compromise outcomes. Aggressive surgical intervention to resect devitalized tissue and establish wide drainage remains the hallmark of care, and will salvage the significant majority of patients.